While landmark album Tell All Your Friends should have propelled Taking Back Sunday to legendary status, intra-band disagreements of old and patchy releases of late seem to have stunted any chances of getting back to those early 2000s heights. Still, they are adored for both their untouchable days and strong, more recent collection of singles by a dedicated fanbase and tonight in Manchester is one of a number of sold-out shows. In a bid to champion homegrown talent, Manchester’s own Milestones (7) are opening proceedings. Their twinkly pop rock feels warm and familiar, but the lukewarm crowd reaction prevents Call Me Disaster and lighter-ready Shot In The Dark from reaching the arena-ready heights they’re capable of. When frontman Matt Clarke’s adrenaline-fuelled leap from the stage meets mostly raised eyebrows, it’s easy to imagine the presumably less disheartening reaction the five-piece would get from a better audience. Their live presence is undoubtedly a strong one, but difficult to separate from peers in the same genre. In a bit more material’s time, Milestones could definitely own this room. 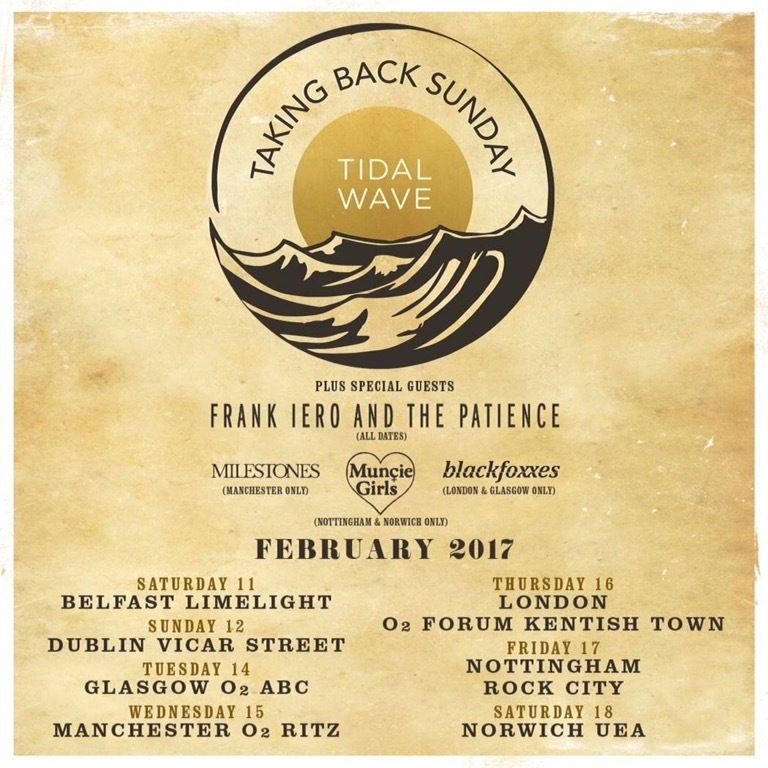 In terms of ensuring tickets to your tour sell, having an ex-member of My Chemical Romance support you is not a bad strategy. There are huge screams when Frank Iero And The Patience (7) take their places onstage, and the atmosphere doesn’t really change until they leave. Audibly, Iero and his band are a flurry of guitars and screechy vocals (while Iero’s are the most interesting, guitarist / backing singer Evan Nestor is by far the focus), but it’s not something that translates to actual movement. While it’s a great set, it’s a bit too samey (aside from .weighted. being the rowdy ray of sunshine needed to break up all the angst) and the set does drag. It’s a huge shame considering the extent of talent and ideas here, but it’ll do nothing to dent the crowds who’ll follow Frank’s name wherever. It’s disappointing to see a noticeable portion of the crowd move to the back of the room or leave altogether after Frank Iero And The Patience, and as soon as Taking Back Sunday (9) take their place, that point is hammered home in the best way possible. The set has been picked in such a way that there are no lulls whatsoever. Even choice ballad Better Homes And Gardens is preceded by singer Adam Lazzara talking about how much the song means to him, which makes it all the more moving. Deep cuts are sporadic, too, and mainly from recent albums. But even newer tracks have visibly been rehearsed and rehearsed (just like Lazzara’s trademark mic swing – not one drop all night), and all five members are clearly on top form. It soon becomes evident that this is why Taking Back Sunday have kept their stalwart status despite mixed reviews on recent albums. This is, though, a set for the hits, and there’s no other word that comes to mind other than gargantuan. It’s maybe accentuated by the sheer number of vastly underrated essential listens Taking Back Sunday have in their discography – Liar (It Takes One To Know One), A Decade Under The Influence, Cute Without The ‘E’, MakeDamnSure…need we go on? In an understated way, it has all the hallmarks of a perfect set. There are no huge light displays or endless amounts of out-there personality on the part of the band – just the right balance of everything, and above all, brilliant songs played by a great live band. And at the end of the day, that’s all anybody wants when they go to a show, isn’t it?